Avast! The third edition of the Fill and Cross Pirate Riddles is finally nigh! If ye enjoyed the previous two chapters, then this one is sure to make ye Roger Jolly. Before it is warm enough to go out and enjoy the sun and swimming in real life (at least for some of us) we can jump into this pirate-themed game for some adventure. The game is full of tasks to keep you busy for quite a while. Set sail on the epic quest to find the coveted crystal which is capable of imparting youth, a cup which can impart eternal life to the one who drinks from it, or a doubloon that grants its beholder with good luck. All of this booty and more can be yours if you can take the island before any other scallywags claim it. The Pirate Riddles game is set up in a fairly simple layout. There is a puzzle that increases in difficulty as you progress. 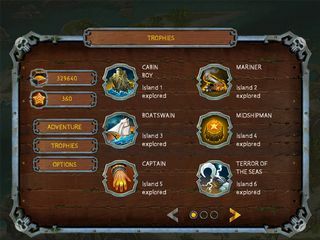 Climb your way to the top in this sea-faring brain teaser and collect trophies along the way. Unlock a variety of islands to play on as you go and grab stars and treasure while you are on the run. If you aren’t into brain twisting games, then find something else. This one is sure to keep your mind working. This is a good game for sea dogs who love games that work the braid. 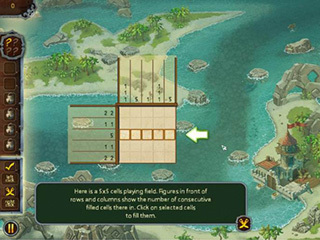 There are more than 120 different puzzles in this game and there are settings available that allow you to adjust gameplay accordingly to suit your style, but don’t hornswaggle. Hoist the Jolly Roger and run a shot across the bow! This game is sure to shiver ye timbers for hours on end. This is Fill and Cross Pirate Riddles review. Download this game here.